"YABBA DABBA DOO! 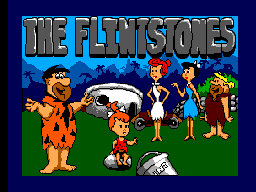 It's the weekend and Fred Flintstone returns home from work very excited about the Bedrock Super-Bowl final tonight. As he arrives home Wilma reminds him of his promise to paint the living-room before her mother arrives on Sunday. 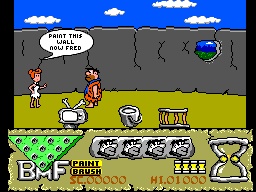 Wilma insists that Fred can only go bowling if he paints the living room, properly, before he goes bowling. Reluctantly, Fred agrees, but he doesn't bargain for baby-sitting Pebbles and painting at the same time. Chaos, fun and Flintstones humour is everywhere!" 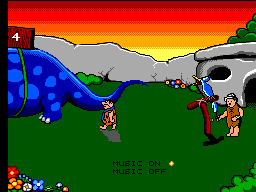 At the title screen, press Up, Right, Right, Down, Down, Down, Left, Left, Left, Left. You can now select your level by pausing during the game, holding buttons 1+2 and then pressing a direction.